After Atlas is Newman’s follow up to her science fiction debut, Planetfall. This story is not a sequel, instead it focuses on our future Earth, that has been left behind by the colonists on the Atlas mission. This aftermath is the setting for a murder mystery plot involving a selection of those left behind by their relatives who went into space. Our narrator is Carlos Moreno, son of one of the colonists, who was left behind as a child with his father, while his mother disappeared into space. Moreno grew up in a cult called the Circle, but as a boy, escaped into a life of indentured servitude, the kind of life most people can expect in Newman’s dystopian vision of our future. Moreno is particularly beholden to the state, having come from nothing in his teenage years living off the grid, and choosing to maintain a stubborn silence when pestered by journalists to talk about his famous mother and her expedition. He becomes a detective, is fitted with an Artificial Personal Assistant (APA) and develops an expensive taste for real food, which is where our story begins. Moreno is sent to England to an upper-class hotel on the edge of Dartmoor to investigate a murder. The victim is Alejandro Casales, the head of the Circle and a former family friend to Moreno. The circumstances are complicated, and there is high stakes game playing going on between the Circle, and the different national coalitions of Newman’s geopolitics. Moreno goes into the investigation as a pawn with little room to manoeuvre, and that sense is both maintained and heightened as the plot unfolds. 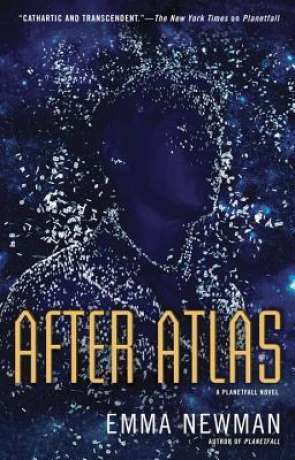 The themes in play in After Atlas are reminiscent of classic Science Fiction. In The Robots of Dawn, Isaac Asimov’s Elijah Bailey was sent to solve a crime where the future of humanity’s colonial expansion was at stake. Many of the elements of After Atlas echo Bailey’s quest. However, Newman’s use of her environment is much more pronounced, injecting the story with a sense of urgency rarely found in an Asimov novel. Bailey was given time and space to think at his leisure, with his overseers kept at a remote distance. Moreno has no time and his supervision is constant. This is augmented by the presence of his APA, a computer system embedded into his mind, the provides him with a constant network connection and talking companion, when he needs to think through elements of the case. Newman’s vision of the future also includes a vividly described virtual reality forensics system which is an incredibly plausible application of today’s technology. Like Bailey, Moreno is pressed to find a solution to the murder or suicide, not the actual truth. However, unlike Bailey, who is permitted to discover the truth in private, Moreno’s digging beyond the requirements of his employers, invokes a vengeful response. This element of the plot is quite complex, and it is a complement to Newman’s writing that we are able to see how each problem arises, without any sacrifice of pace or over introspection. This is where After Atlas steps beyond its murder mystery premise again, delving into the agendas of the international factions without losing the sense of Moreno as a lone individual on a chain, being passed between different masters. In a way, this is where the novel shows its colours as Planetfall’s progeny, continuing the story after the main arc, as presented to us, has concluded and delivering a final twist in the last few pages. After Atlas is an excellent novel that invokes curiosity on many different levels. It can be ready for its murder mystery, for hints of what happens next in the Planetfall story or as a near future dystopia. Readers coming to the book looking for any of these themes will not be disappointed. Written on 4th February 2018 by Allen Stroud.